It’s the end of the week, but that doesn’t mean an end to learning more about your favorite Apple devices. Each week, the Friday Five takes a quick look at a Mac OS X or iOS app to point out five things you may have overlooked before. Whew! There’s almost nothing worse than having a paranoid computer (although a paranoid android is a close second). Using the iMac’s dictation capabilities, I quickly soothed its fears by telling it of the many ways it would soon be safe from failures, and that thanks to The Rocket Yard, I knew a lot about backups. I told it about the OWC 4.0TB ThunderBay 4 mini RAID 5 edition it would soon be sharing power and data with. I’d set it up as a massive Time Machine volume, so my iMac would always be saving little pieces of its precious mind. You know, I think that iMac was almost purring with contentment after I told it that (turns out it was one of my cats snuggled up against the warm back of the machine…). I could hear the sound of the iMac and my MacBook whimpering as I told them this scary story. I knew especially that the little one, the cute little 12-inch Retina MacBook, would have nightmares for weeks if I didn’t say something calming right away. 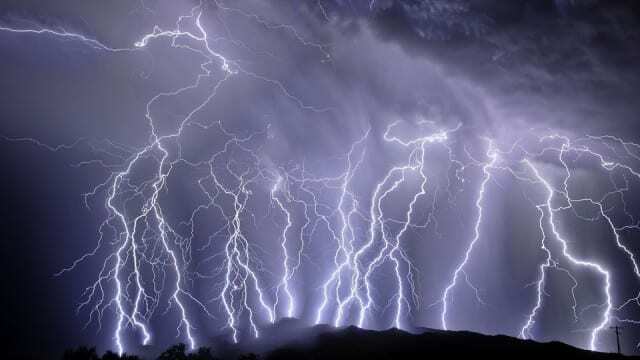 Lightning damages or destroys a lot of computers every year, but there are things that one can do to protect their fragile electronics during a storm. Perhaps the easiest way is to simply shut the machine off and unplug it from a wall socket if lightning is getting close. But what if you’re not at home when a storm is nearby? That’s when a surge protector can help keep things safe. Surge protectors or even a hefty uninterruptible power supply can’t protect your Mac from the tremendous pulse of current from a direct strike on a house or office, but they can give your electronics protection from the many lesser surges that can happen during a storm. I waved the 8-outlet Belkin Commercial Surge Protector that my computers are plugged into in front of the iMac’s FaceTime HD camera, and I could just feel the good vibes coming from its 5K Retina display. Hmmm. I could swear that my iMac just tried walking away as I sat down with a fresh cup of coffee. Since this Halloween-induced ability to communicate with my Macs was getting more powerful by the minutes, I asked the iMac why it was trying to move. Time to calm him down again. A quick search on “Valium for computers” found no responses, so I directed my browser towards the one place I knew I could find something that would ease my iMac’s fears — OWC. 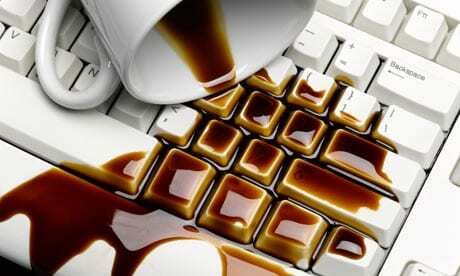 Sure enough, there was an entire page dedicated to keyboard covers to keep mishaps like spilling my coffee from ruining the iMac’s entire day. Thanks to the Sonnet Technologies Carapace Keyboard Cover for the Apple Wireless Keyboard, my iMac was now going to be living a life free from fear of splashes, and all of those food crumbs as well. I could see the iMac visibly relax as I explained how I could even keep the cover looking good by washing it occasionally. “So, what else scares you, iMac?,” I asked as our paranormal conversation continued. “Well, I sometimes think that my memory just isn’t up to par. I have to write things to my disk, and that just slows everything down. I don’t want to be slow! I want to be speedy and useful!,” it whined. …and with that, I woke up, the taste of stale Butterfingers candy bars in my mouth. Had I just been dreaming, or had my Macs really talked to me? Well, the OWC products that kept my Macs from being afraid are all real, so maybe this actually happened. What’s scaring your Mac, iPad or iPhone this Halloween? Be sure to take some time this Halloween weekend to take a peek at some great protective gear and expansion products, and take advantage of the OWCtoberfest savings before they fade away at midnight Nov. 1, 2015.